Our ability to reproduce shapes and sizes of complex configurations allows designers the freedom to recreate historic shapes and finishes without sacrificing the authentic look. 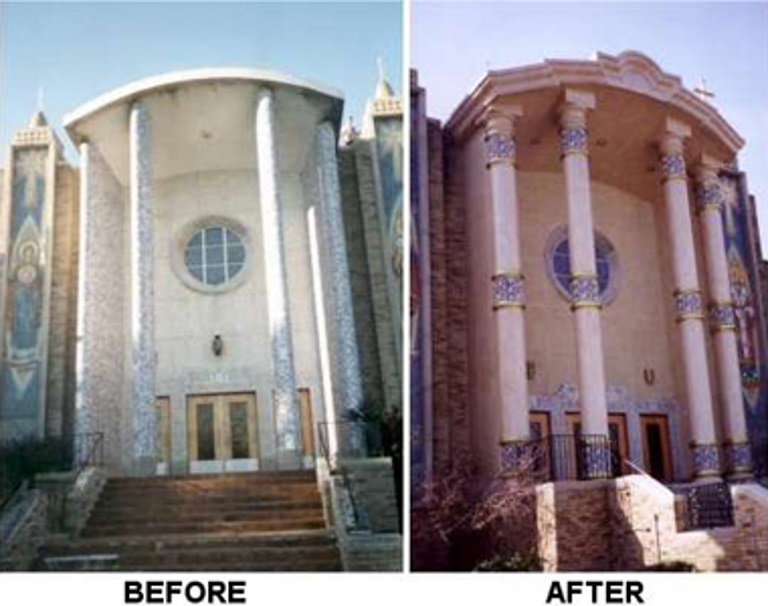 Restoration projects using fiberglass products are gaining further popularity and opening the eyes of owners, builders, architects, engineers, and developers. 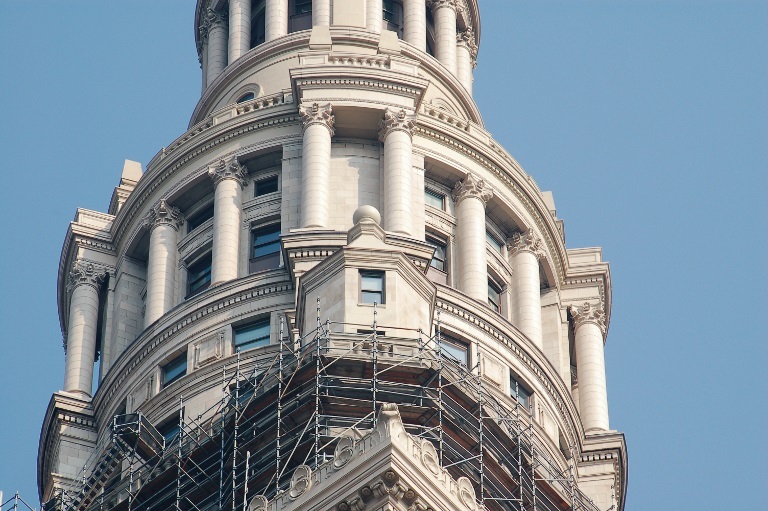 The restoration market for FRP has not yet blossomed anywhere near its potential. 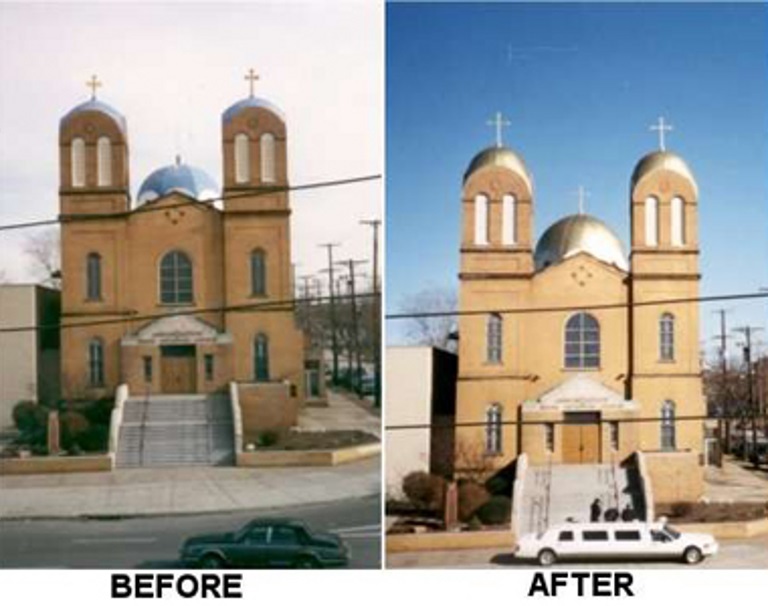 This is due to the unawareness of the benefits of FRP and the lack of specialized companies like Architectural Fiberglass, Inc. Our education efforts to the construction industries have been convincing architects and contractors the long-term benefits of FRP. 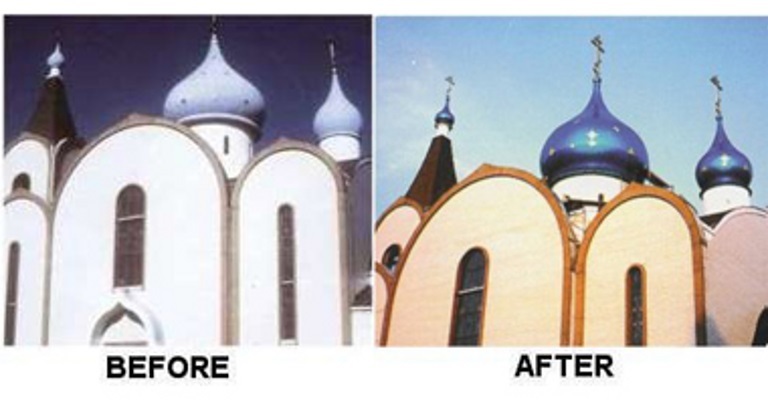 New innovative technologies and molding techniques make our architectural fiberglass indistinguishable from authentic materials. 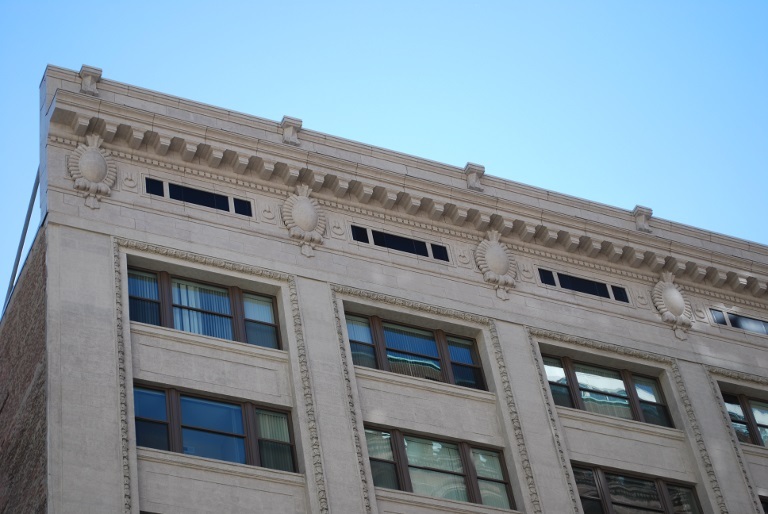 Fiberglass can be molded into a number of different finishes to mimic wood, stone, terra cotta, concrete, steel , marble, granite, copper, and other popular building materials. Finishes can range for a smooth dull matte to a high gloss polished look, or a slight texture to a rough stone texture. FRP parts are chosen over other material because it is lightweight, cost effective, corrosion resistant, and is virtually maintenance free. 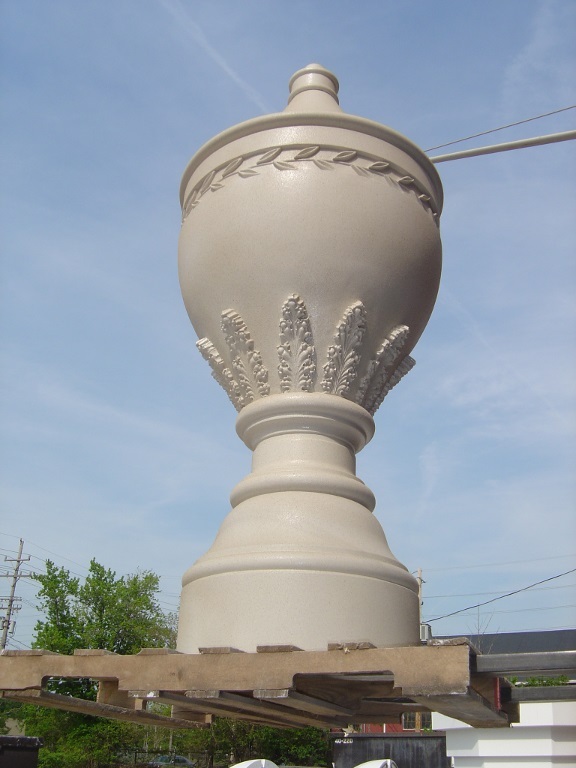 Fiberglass products can be painted or the color can be molded in the surface. Because FRP begins with liquid polymer resins and formable glass fibers, the finished shape can be curved, corrugated, ribbed, or contoured in a variety of ways, with varying thickness. Per unit of weight, FRP is among the strongest commercial material available. Pound for pound, FRP is stronger than concrete, steel or aluminum. FRP parts can often reduce maintenance cost when compared to many other traditional building materials. Fiberglass is very practical when compared with the material, maintenance and installation cost of other traditional materials. One should not assume that the material cost of fiberglass is low, but the installation methods and procedures boast lower installed cost and lower life cycle cost. 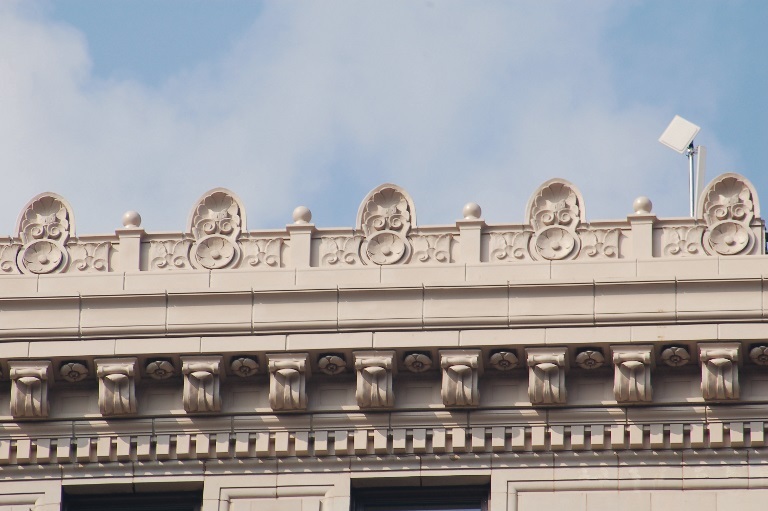 Stone or terra cotta decorative ornaments can become dangerous when a building's supporting structure deteriorates to carry the load of a solid, heavy material. 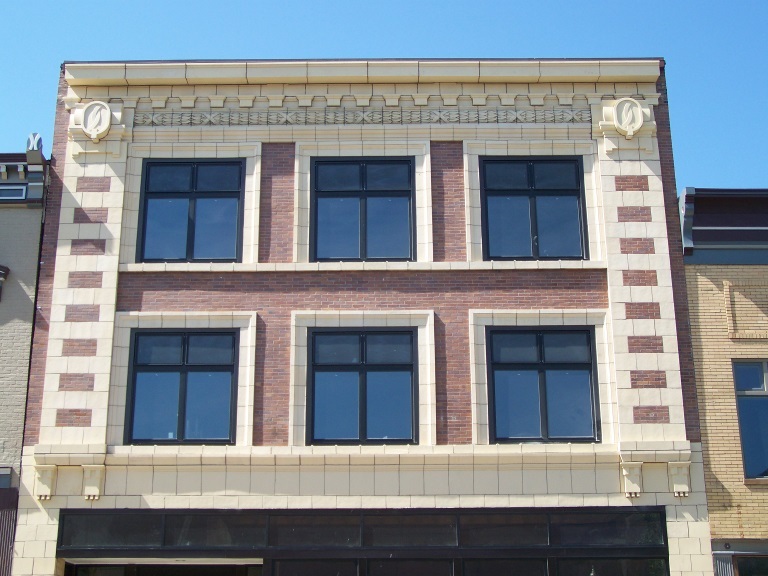 Usually stone or terra cotta features require additional robust framing and attachment areas. Fiberglass elements typically weigh 1.5 to 2.5 lb. 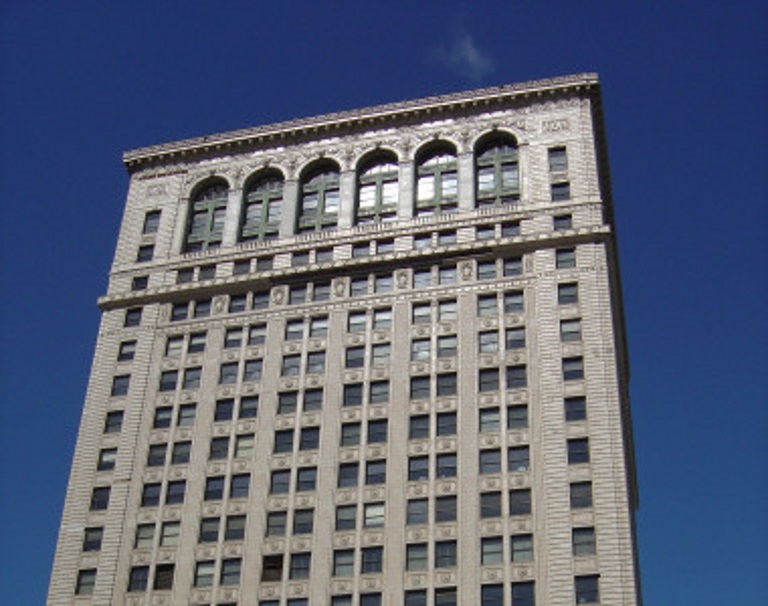 per square foot; and can be attached to a building without heavy steel supports or structural rehabilitation of the attachment areas on a building. 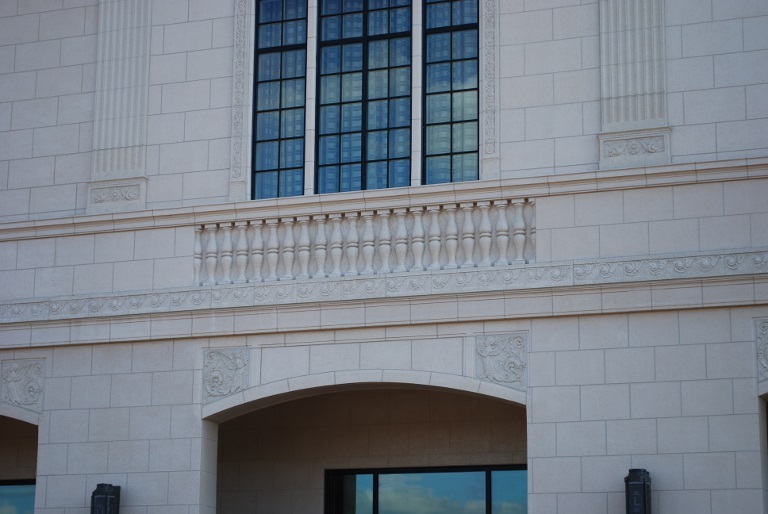 Intricate details that are molded into fiberglass such as brackets, medallions, steps, drip edges, and curves add rigidity and strength to fiberglass elements. In most cases minimal pressure treated wood blocking or galvanized steel studs is sufficient for attachment. 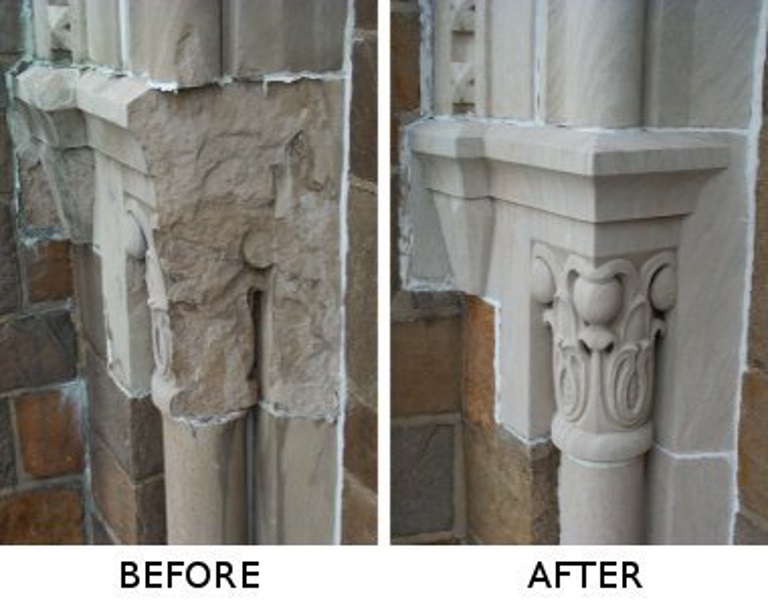 Restoration contractors love the fact that fiberglass is so lightweight, it in turn lowers their all around installation cost and is easier to install than traditional materials. Fiberglass ornaments can be screw-fastened, bolted, or hung onto a concealed clip system. Fasteners should be galvanized, stainless steel, or non-corrosive. 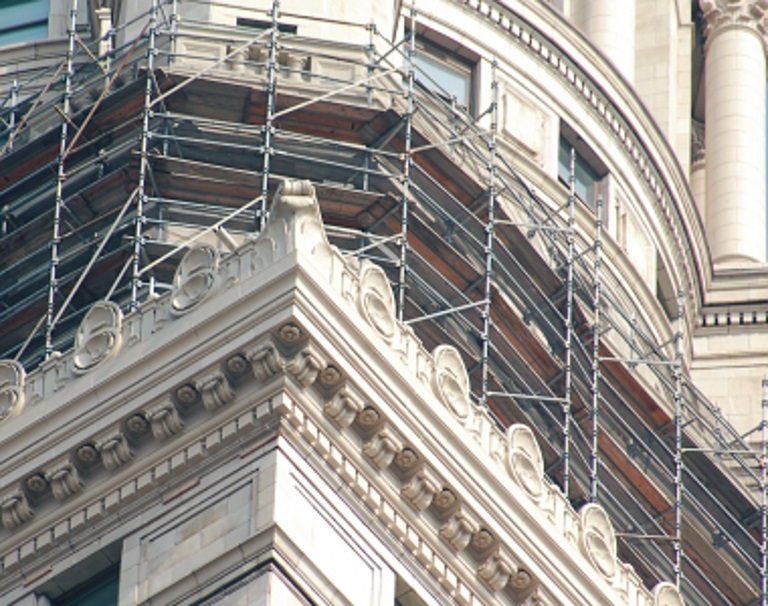 Usually at 3/16- to 3/8-inch typical thickness general-purpose scaffolding and manual placement of cornice is sufficient. General contract workers and carpenters are frequently capable of installing fiberglass without heavy lifting equipment and cranes. 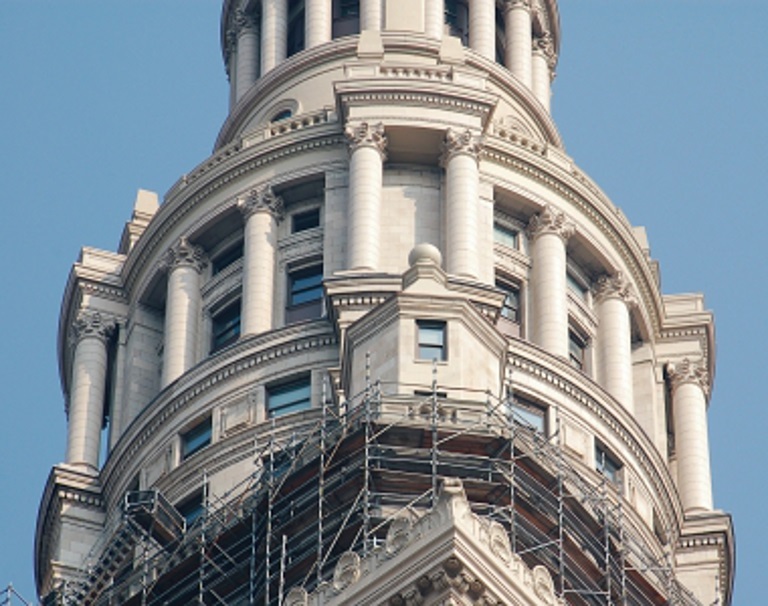 Fiberglass is gaining substantial recognition in the restoration market. 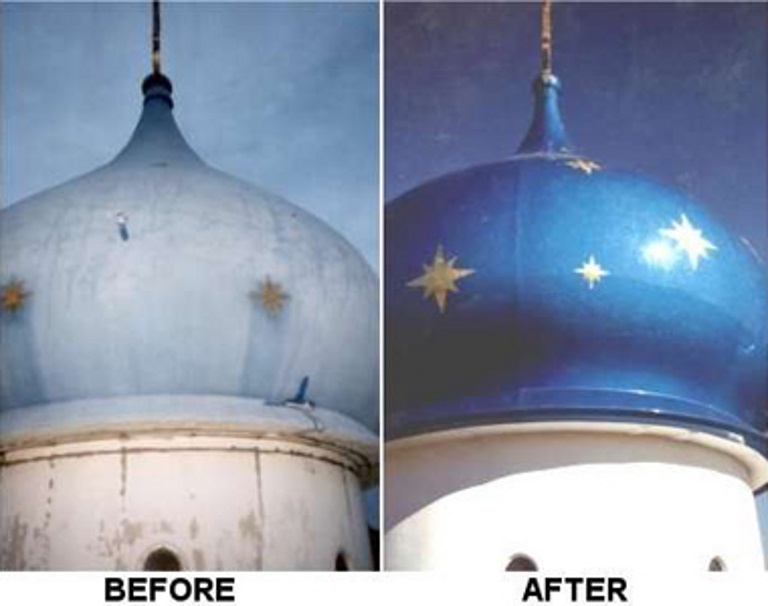 Many preservation and landmark agencies are realizing the advantages and are accepting FRP as a viable alternative to traditional materials. 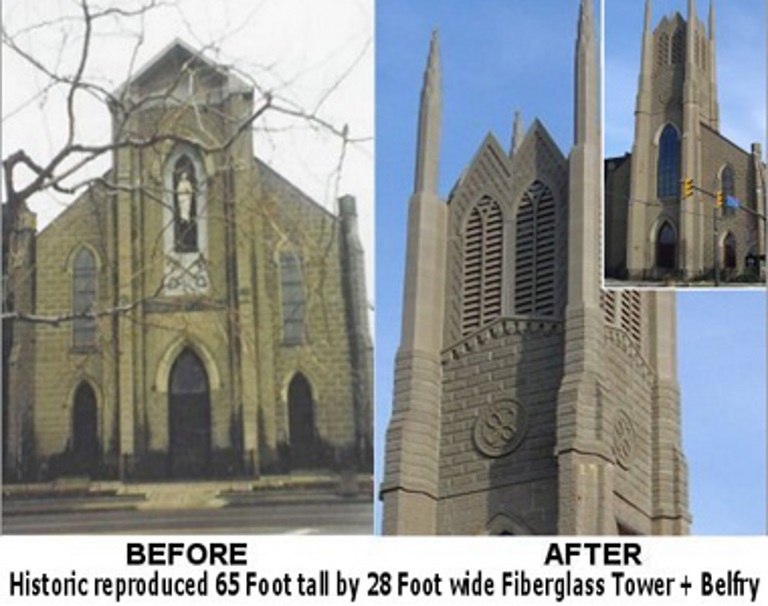 Preservation agencies are skeptical at first but after seeing examples and sample of fiberglass it is a convincing and a faithful alternative to more costly and less durable materials. In most cases using traditional materials is cost prohibitive, and it is difficult to find companies qualified and able to produce such materials. 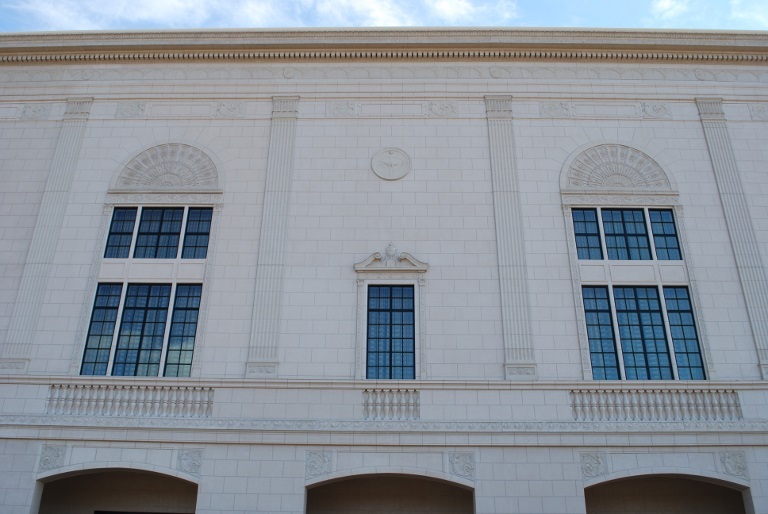 Decorative elements on the rear façade of The White House have been restored using fiberglass components. 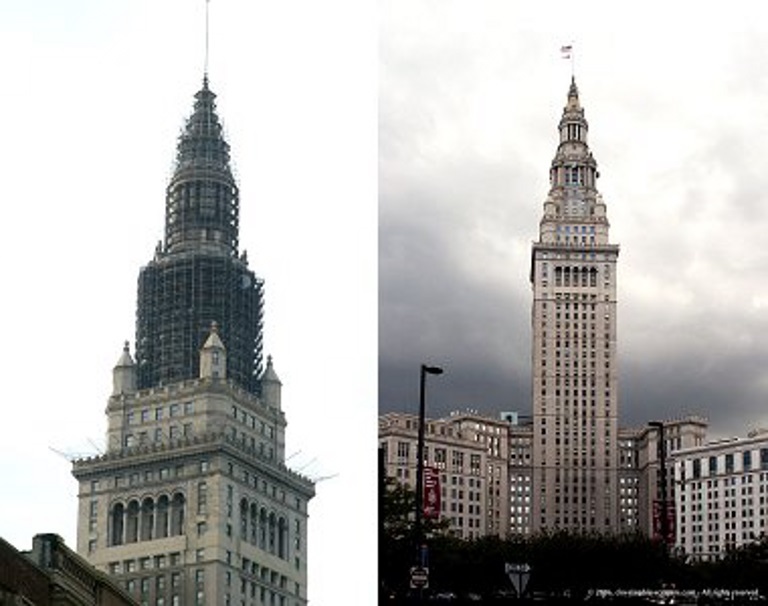 Many other historic landmarks have been repaired or replaced with fiberglass elements. 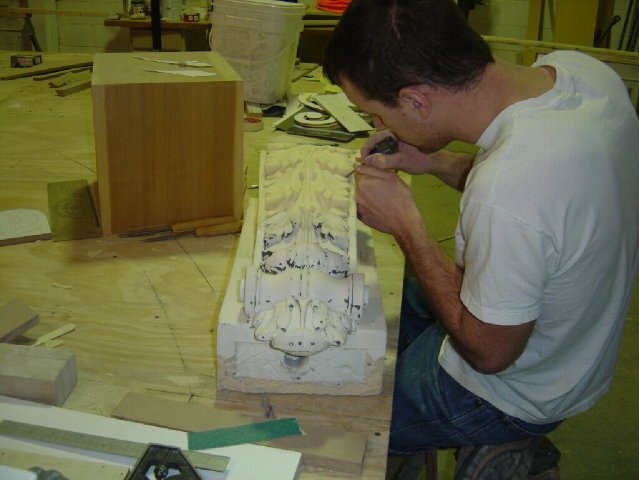 Often custom molds can be manufactured from originals provided to us by our customers, or molds can be taken directly off of a decorative elements onsite. Onsite molding requires ideal weather, flexible job conditions, and access to the decorative elements that is being molded. 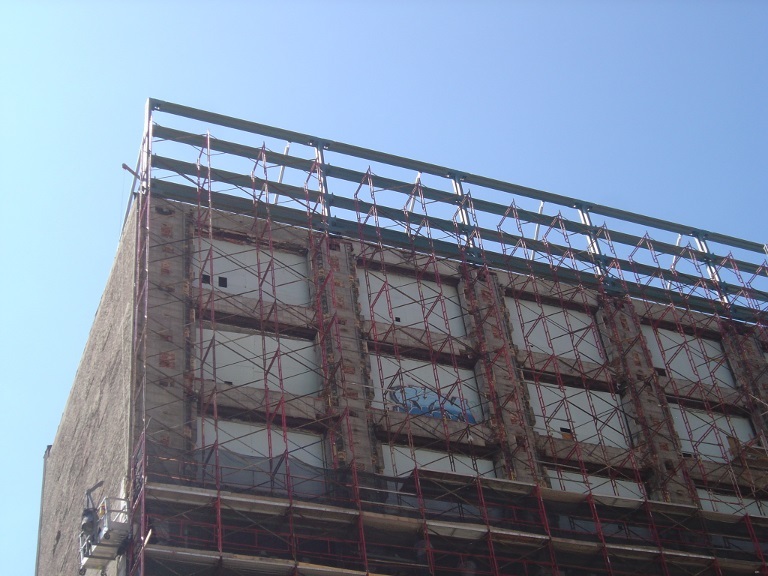 In most cases scaffolding or man lifts are needed. 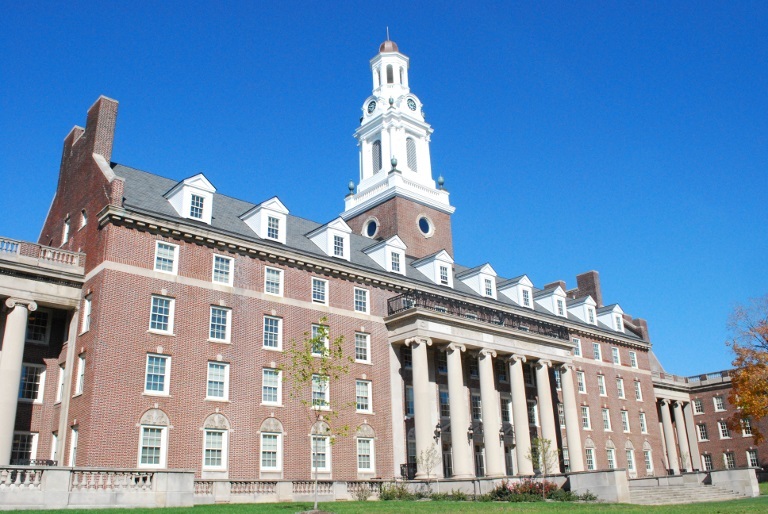 When originals are not available the process involves examining historical photographs and/or drawings of the building. After interpreting the shapes and architectural details, shop drawings are produced. From the drawings a pattern is produced. 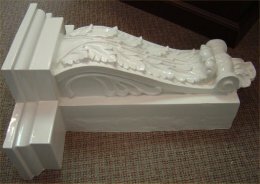 The pattern represents the original part that is to be manufactured from fiberglass. The pattern is hand crafted from wood, foam, plaster, clay or other materials that can be carved and shaped to achieve the desired look. Patterns can also be made from a CNC (Computer Numeric Control) machine that machine routers the pattern from a solid material. 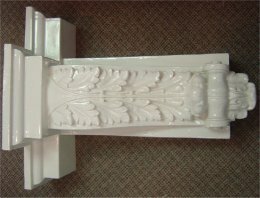 Before molding, the desired finish is applied to the pattern. From the original pattern, a silicone rubber, polyurethane rubber, or fiberglass mold is manufactured. Flexible rubber molds allow for molding of complex shapes with heavy textures or deep undercuts. 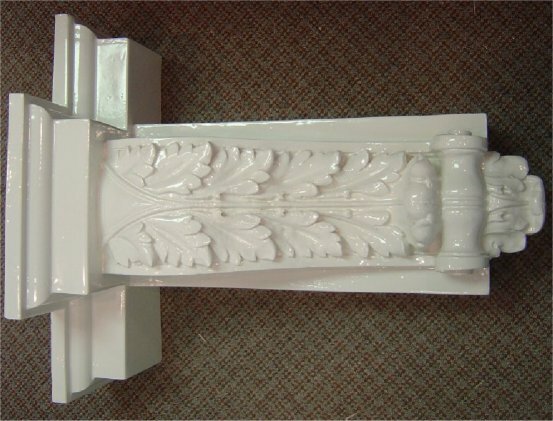 Rubber molds are usually used for very decorative elements that are highly detailed. The flexible rubber transfers the detail needed for molding the fiberglass element, but also has the flexibility to release the part. Rubber molds are not as dimensionally stable as fiberglass molds, and require additional molds when a high volume of parts is needed. Fiberglass molds provide the most stability and can withstand higher volume use without distortion. From the mold, exact reproductions of the original pattern are fabricated. 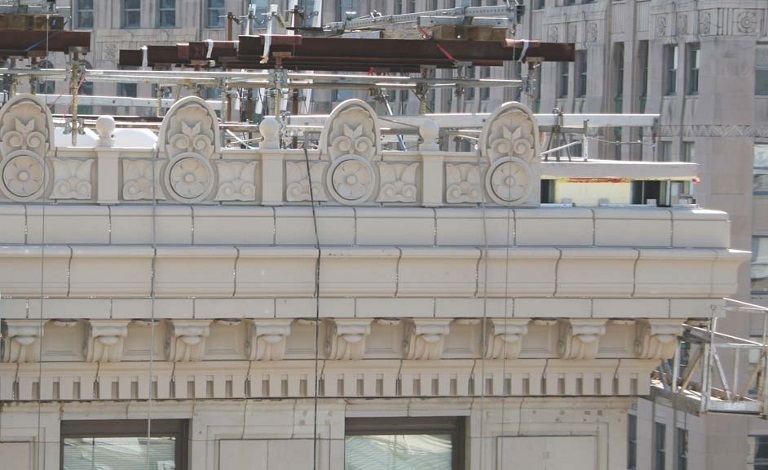 Multiple castings with the smallest details from the pattern are seen in each molded fiberglass element. 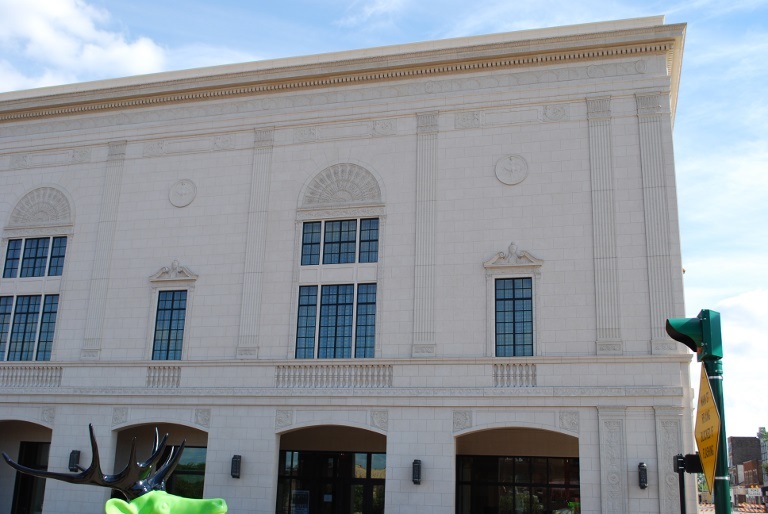 Architectural Fiberglass, Inc. has recognized the use of FRP in all phases of construction. We now have the task of informing and educating, contractors, architects, and developers the benefits of fiberglass. 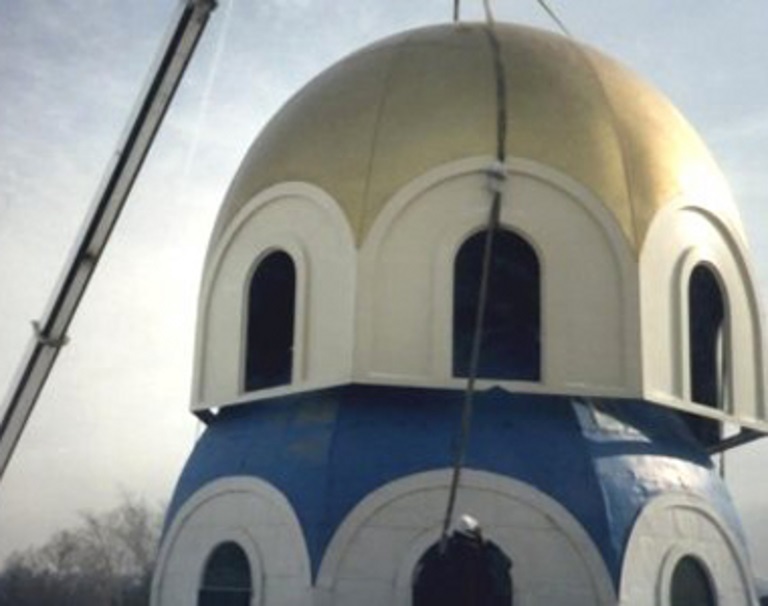 At this time there is no clear, long-term life expectations of fiberglass. 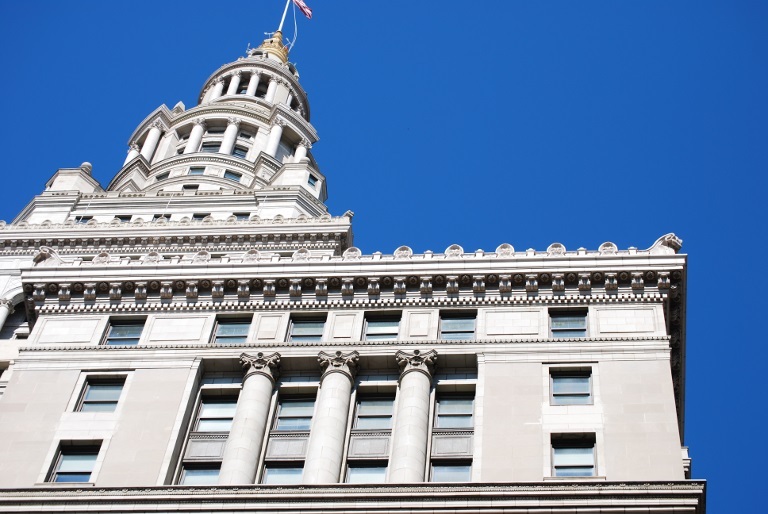 This is because fiberglass products have been installed on buildings for more than 50 years, with no significant sign of deterioration. Perhaps in another 50 years we can give you better answers. 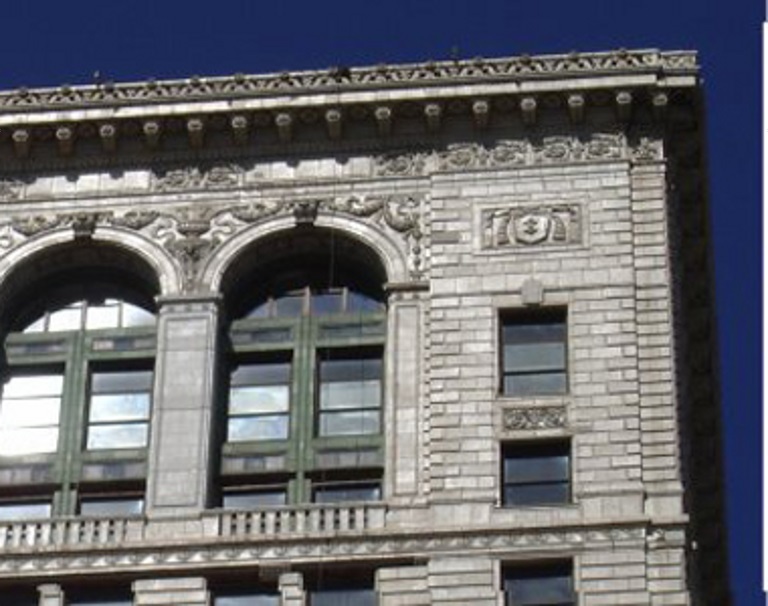 Architectural Fiberglass Inc. (AFI) was faced with the challenge of replicating non-existing historical terra cotta cornice and other decorative elements. One such element was a severely damaged and deteriorated bracket. 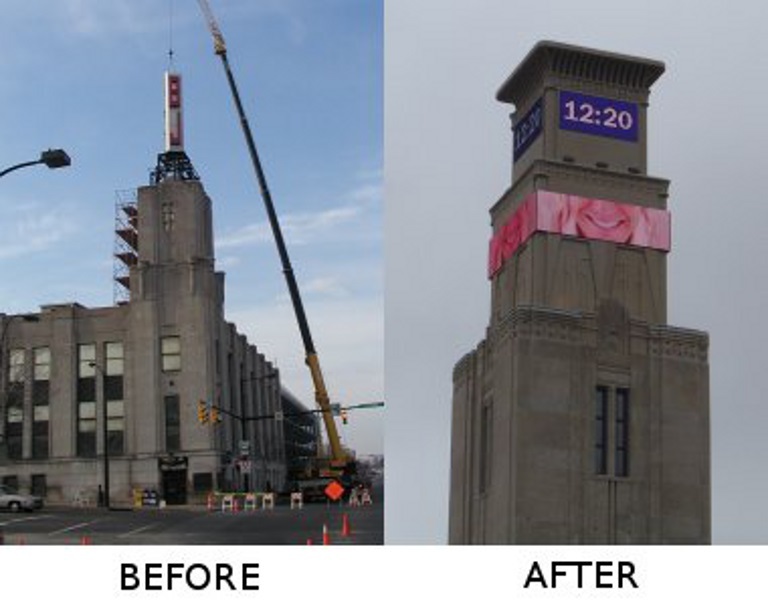 The process involved cleaning the existing 1/3 remaining section of the bracket and examining historical photographs of the building. 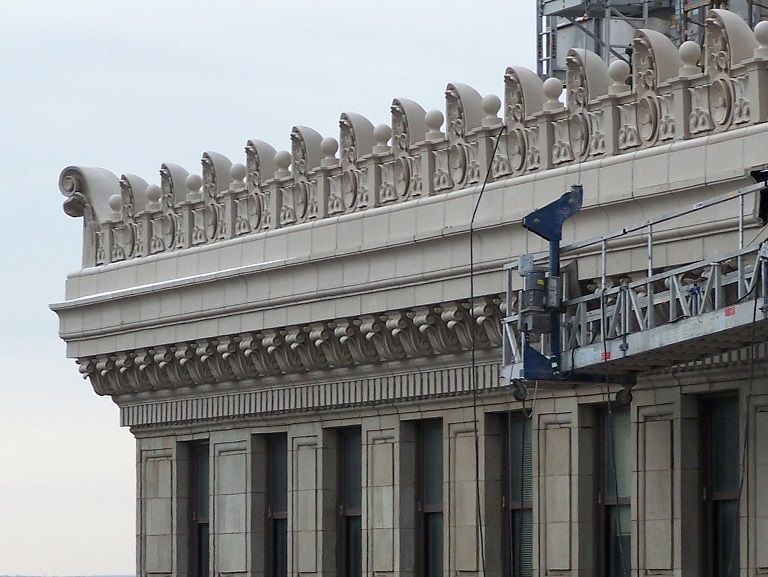 After interpreting the shape and the architectural detail from photographs, AFI began the restoration of the existing bracket. 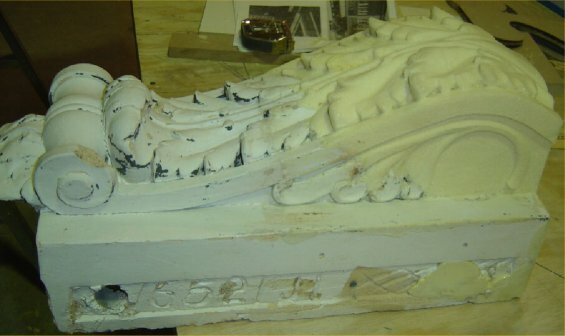 The only way to replicated the original was to hand carve an original pattern for molding. A poured block of liquid polyurethane foam replaced the top two thirds of the missing bracket. The cured foam is rigid enough to carve, but not as dense as wood. The carving is a painstakingly process that requires a skilled meticulous wood carver. Piece by piece the foam is shaved away until the desired result of the bracket is reached. The pattern is then sealed, painted and a flexible rubber mold is cast off the pattern. The rubber mold reflects a mirror image of the pattern and picks up all the fine detail of the pattern. Fiberglass parts are then molded for exact replicas.